Prior to this step, you should have generated the cartons from the pick tickets. If you have already completed the task above and are ready to print shipping labels, then follow the instructions on this page. First open the Carton Maintenance application in Simparel. The Carton Maintenance window will open. You can search for Cartons that are unshipped or that have no labels printed fro them. Click on one of the options in the top right. 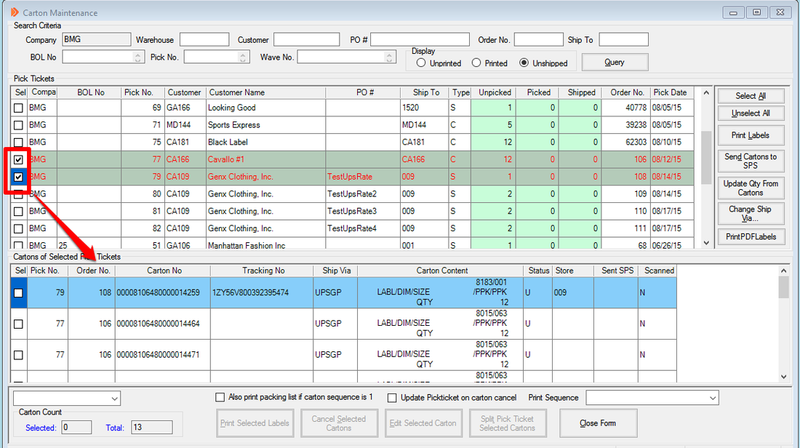 After clicking on the button, you will see the open PTs with generated cartons appear in the Carton Maintenance window. 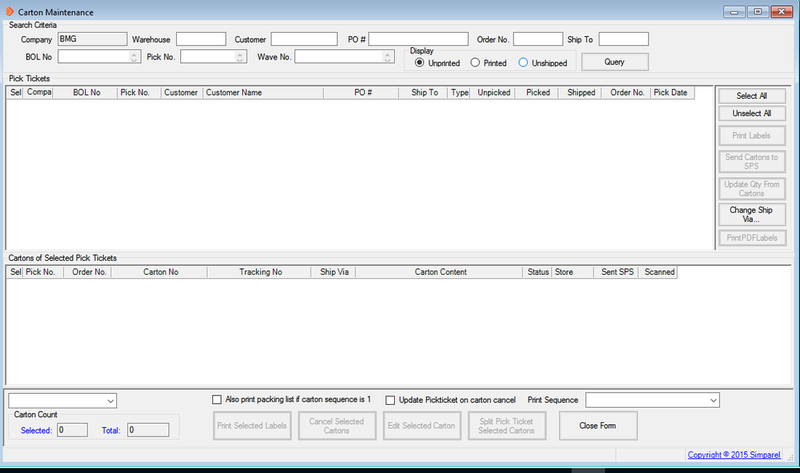 Click on the checkbox of the PT for which you would like to print shipping labels. The information that shows up under the Cartons of Selected Pick Tickets section is for the cartons that were generated for the PTs you checked. If you need to change the Ship Via, you must do so NOW, before you generate a tracking number and print a label. If you don't need to change Ship Via, skip this step. First, check the PT whose ship via you want to change. Then click the Change Ship Via button on the right. A window will appear after you click Change Ship Via. Double click on the Ship Via you want. The Carton Maintenance window will reappear. You should see the Ship Via change to reflect the option you just selected. 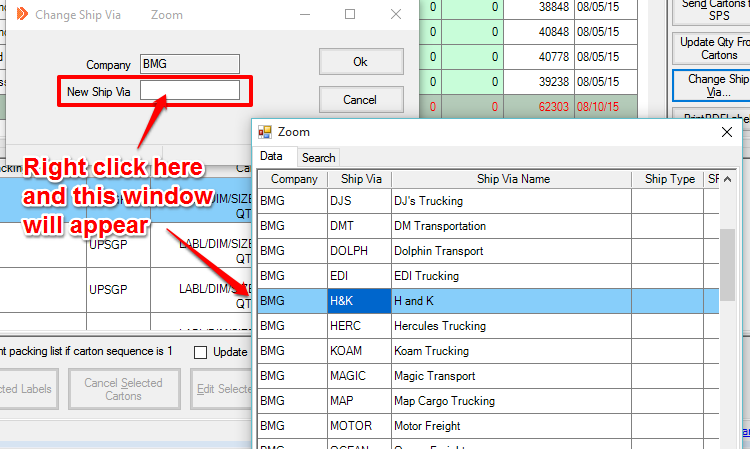 If you do not need to generate tracking numbers for this shipment, then scroll down to learn How to Print Labels. Otherwise, stay in this section and read on. Under the Cartons of Selected Pick Tickets section, check the cartons which you want to generate tracking numbers for. Note that this options is currently available only for UPS shipments. Alternatively, you can select all cartons by clicking on the drop down menu in the lower left. Click on Send Cartons to SPS. The system will process the tracking numbers, which may take a while depending on how many tracking numbers you have to generate. You will see a progress window appear during this time. The tracking numbers will appear for the selected cartons under the Tracking No column. Select all the Cartons by checking the box on the left-hand side. Click on Print Selected Labels at the bottom. The printer connected to your computer and Simparel will print out a label for each carton you have selected. If you need to cancel a carton and you have already generated a tracking number, you have to void the tracking number first. Select Void Selected Cartons from the drop-down menu on the left-hand side. The system may take a few seconds to process the void request. After it is completed, you will see the tracking number disappear from that carton's row. Check the carton you want to cancel. Click on Cancel Selected Cartons. Click YES if you want to continue to cancel. The carton should disappear from the Carton Maintenance window. Continue doing this with other cartons and/or other pick tickets if you need to.